When Adeel first views the statue in a cave in Bamiyan — known as “the place of shining light” — he has a profound spiritual reaction and decides to steal the sculpture for himself. When Khalid and Ghalib realize their prized possession is missing, they conspire to do whatever it takes to have it returned — before it’s lost forever. Taking readers on a wild journey from the valleys of Afghanistan, to the magical mountain kingdoms of Northern Pakistan, and the diplomatic enclaves of Islamabad, The Place of Shining Light is a riveting and timely story of art, war, greed, and spirituality. 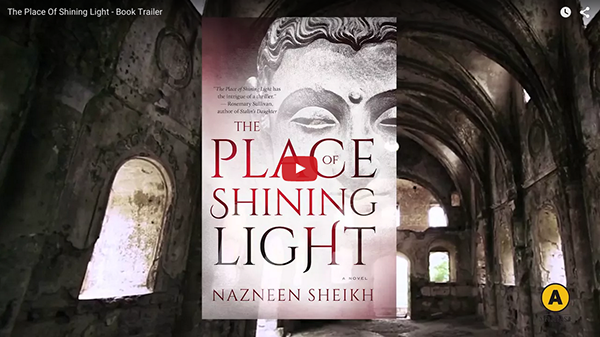 The Place Of Shining Light by Nazneen Sheikh publishes on September 12th, 2015. Nazneen Sheikh has written several fiction and nonfiction titles for adult and young adult audiences, including Chopin People and Ice Bangles. Her culinary memoir, Tea and Pomegranates: A Memoir of Food, Family, and Kashmir, won second place in the English and French special interest food and beverage book category from Cuisine Canada and the University of Guelph. Nazneen was born in Kashmir and went to school in Pakistan and Texas. She lives in Toronto.